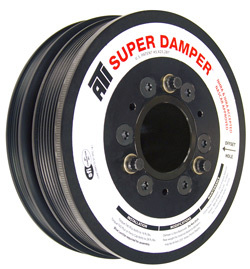  These dampers are outer shell, inertia weight and o-rings only. The inner shell is integral with the crank hub. Hub is 1” longer than standard. Hubs for these assemblies have a 2.280 counterbore. A standard length crank bolt is used and the mandrel bolts to the 3 pulley mounting holes. This eliminates the 4” - 6” long bolt that is ineffective in retaining torque. Adapter part # 916321 is available for existing mandrels with 1.245” pilot. Aluminum hubs for these assemblies have a 2.250 seal diameter with a .500 wall thickness and fits inside the Jessel lower pulley. 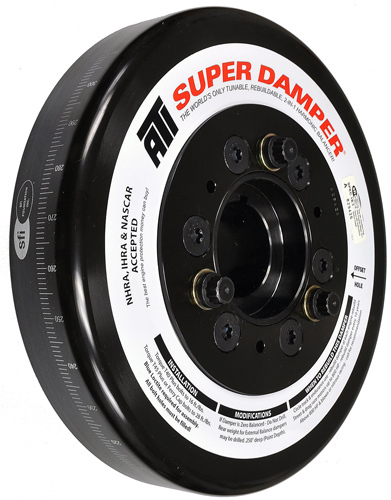 This eliminates hub failure at the keyway on engines driving dry sump pumps and pulleys. For Comp Cams style belt drive, use a 7", 2 ring Damper due to fitment issues with the cam timing adjustment. Hub must be machined to fit inside lower cam gear. Use hub part # 916172 for 1.245” crankshaft with BB seal and Chevy bolting. Timing pointer must be corrected. Original pointer shows approximately 10° @ TDC (advanced) when the piston is at TDC. Non-stock damper - 8 week lead time required. Aluminum Hub (part #916099) available. Add $25 at time of order. 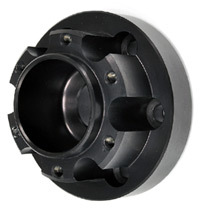 For boat applications, ATI offers Hub Part #916098 to allow the damper to be mounted to the back of the crankshaft. Use hub part #916136 for 1.246“ SB crankshaft with BB seal and Chrysler bolting. One-piece hub and inner shell. For equally spaced OEM holes & ignition trigger, use #916134A. The BB Chevy & SB Chevy with BB 1.600” nose both use a unique 2-piece hub that allows the stock length bolt to hold the damper to the crank & a separate extension to locate the blower pulley and crank trigger. Must be counter sunk drilled for Y Body apps. Requires shorter serpentine belt. Goodyear pt #4060785 for accessories & 4040405 for AC. Use hub part # 916033A for integral 8mm 28 tooth HTD pulley. Contains 40 durometer rubber. Not for full race engines. Specify 66 rubber or call. Damper assemblies have all countersunk bolts so nothing protrudes past front of damper. If you have an older damper and are ordering a new shell assembly only, you must cut a .090” x 45° chamfer on the front of your hub. ATI can also perform this operation for $40. 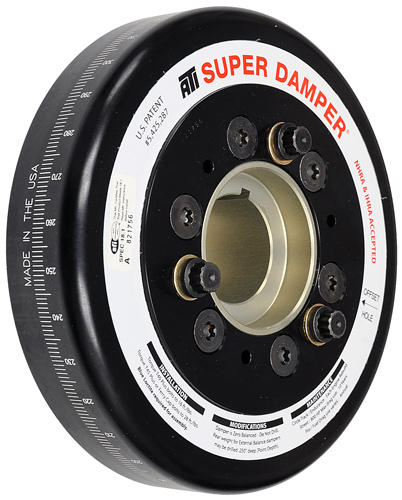 Dampers furnished with #916320 hub spacer. For ‘97 & up Camaro/Firebird or ‘96 & up Corvette engine with a reluctor wheel; discard spacer provided. For hubs with a 6 hole bolt pattern and 2.25 seal, use hub #916049B for B body, 916048B for F body and 916096B for Y body. Hubs are made of heat-treated alloy steel. Washer #953070 is required with LT1 hubs and is shipped with dampers. 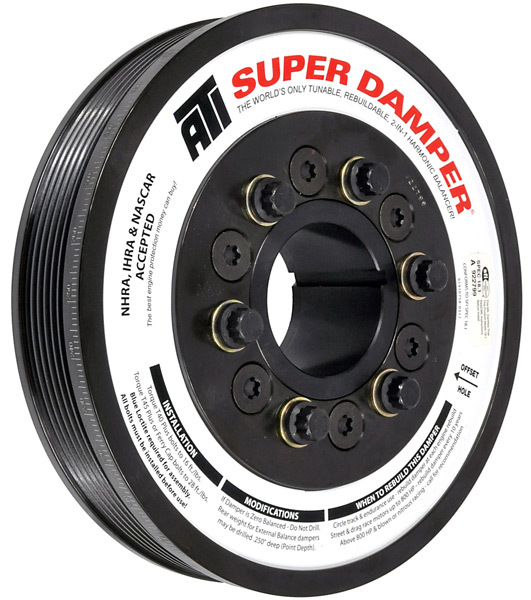 Non-removable A/C pulley - OEM diameter. Contact Lingenfelter for proper belt set-up. 2010 LS3 Corvette Grand Sport coupes w/Manual Transmissions come equipped with a Dry Sump system, so an LS7 style damper is required. For no A/C - Order Hub #916349D with pulley delete ring. For applications making over 20 lbs. of boost, ATI offers a stronger, heat-treated & double keyed hub. Available outright or as a $25 upgrade on new orders. Pt #916164H for 917345 and #916032 for 918856. Steel hub #916037A has 8mm, 25 tooth HTD belt drive instead of serpentine. Requires and includes 1.25” longer crank bolt (951359) with washer (953075). 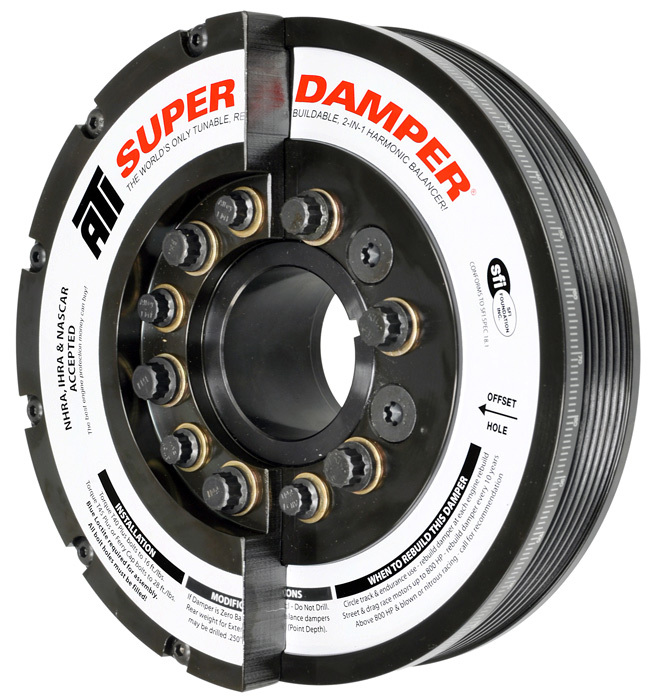 Dampers furnished with #916320 hub spacer. For ‘97 & up Camaro/Firebird or ‘96 & up Corvette engine with a reluctor wheel; discard spacer provided. For hubs with a 6 hole bolt pattern and 2.25 seal, use hub #916049B for B body, 916048B for F body and 916096B for Y body. This hub has a 3-bolt pulley pattern. For a 6-bolt pattern, use hub # 916048A. 10% UD - Requires Belt - Dayco #5060625, Goodyear #4060625, Delco #SK625. All hubs have 3/16 key @ std SB 10O location. 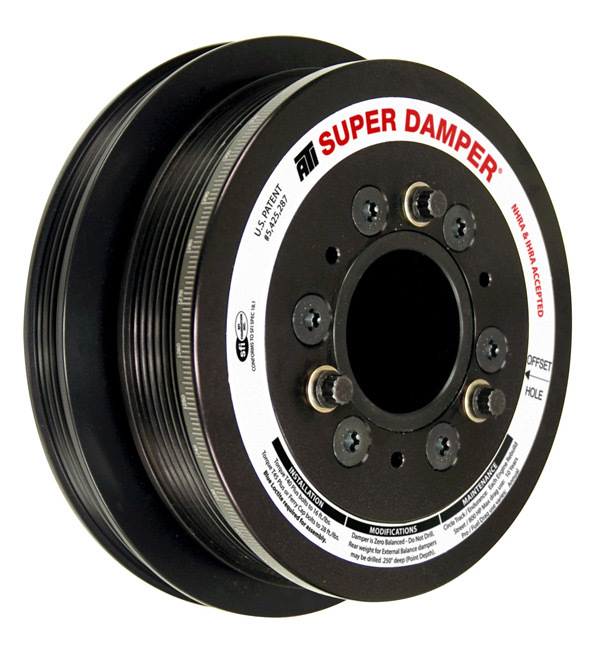 Only OEM A/C pulley size available for LS3 Camaro. NAPA belt #s 25060827, 25040353AC. Includes timing cover seal (#973136) and seal installer (#916113). No supercharger pulley supplied. Must choose #916153 (OEM), #916105 (5% OD),#916106 (10% OD), #916227 (17% OD), #918159 (24%OD). For dampers requiring an LS7 / LS9 dry sump with 2010 - 2015 Camaro accessories drives, see chart below. "ATI's 10-percent pulley increased output to 725 hp and 736 lb-ft. That’s a solid 156hp increase over our baseline numbers. Not too shabby for a bunch of bolt-ons." Available in several diameters with your choice of 6, 8 or 10 ribs. ATI does not recommend using these dampers without A/C pulleys. If you plan on running a non-A/C set-up, please contact ATI. Can be built with a smooth shell assembly #918850 and titanium bolts. Available with 7.53" OD shell assembly #917073-60 with 60 durometer o-rings. Due to variations in GM’s production, the spacer provided may or may not be needed. Damper is 10% UD from OEM. Use belt #4060635.
assembly only, you must cut a .090” x 45° chamfer on the front of your hub. ATI can also perform this operation for $40 if you send your hub in. CTS-V is 10% UD - Use Duralast Part # 375K4 for AC pulley and Gates Part # K060806, 6 rib for accessory drive. For applications making over 20 lbs. of boost, ATI offers a stronger, heat-treated & double keyed hub. Available outright or as a $25 upgrade on new orders - #916032 for 918856. 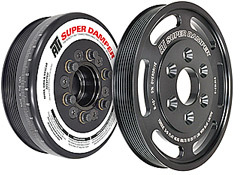 For OEM Drive Pulley - Pt # 916358 or 10% UD Pulley - Pt # 916359 Overdrive pulleys for supercharging available. Consult you Sales technician. All hubs have 3/16 key @ std SB 10° location. 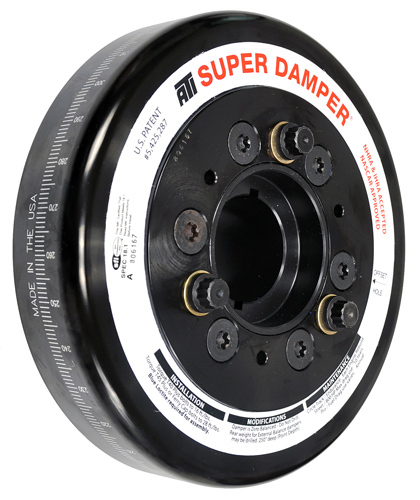 Use damper #917378 for internal balance version. Determine if you need steel or aluminum shells. Labels for this information are listed across the top of the chart in columns 2 and 3. Once you have determined the shell material, you need to find the outside diameter (OD) of the desired steel or aluminum shell. Then choose between 2 or 3 rings and the desired weight of the damper. From the far right section of the chart, select either a steel or aluminum hub for your desired engine application. 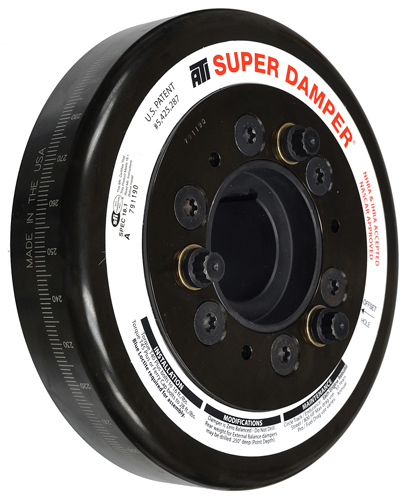 To determine the correct damper assembly part number that intersects is the correct damper assembly. Assembly part numbers that are color coded correspond to the pulley mount bolt pattern listed near the top of the charts.